~~Well, I promised a sneak-peek but I couldn't get myself to stop working. So instead of a sneak-peek I have something better; a finished piece. Yay! ~~This is the third angel in my Little Angel series. (The other two are "Peace" and "Gentleness.") This little angel's name is "Hope." ~~To me butterflies are a wonderful symbol of hope. They start life in such a lowly state and then go through a time of darkness while in the cocoon. But we all know the end of the story; the butterfly emerges with beautiful wings, ready to fly. ~~This piece, I feel, has two meanings. The first is the hope of the new life we can have through Christ. We too can be reborn like the butterfly when we realize our helplessness and ask Him to come into our lives and change us. If God loves to turn ugly little caterpillars into beautiful butterflies, how much more does He rejoice to turn His children into new hope-filled creatures? ~~The second meaning is the hope of making it through a difficult trial in life. Like the caterpillar we've all been through dark times when we feel trapped with no way out. This piece is encouragement to hang onto hope. Brighter days are coming and when you emerge from your trial you will be a stronger, more beauty-filled person because of it. ~~I thoroughly enjoyed working on this piece although it was a new challenge. I'm used to painting my little brunettes so the beautiful white-blonde hair of my model was very new. It felt good to stretch myself though. 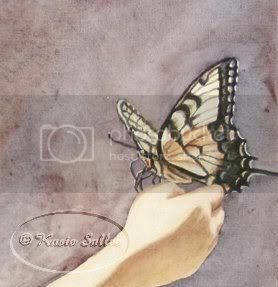 ~~Some other fun news to share is that I placed 1st in the Oklahoma State Fair with my "Gentleness" piece. That was a nice surprise! ~~Well, Fall is in the air and I'm loving it! I'm hoping to freshen up the house a little today. Savannah and I picked up some mums and a pumpkin for our front porch this morning and this afternoon I'm out in search of a Fall-scented candle. I just finished making some Strawberry-Pretzel icecream for an icecream social we're going to tonight. Fun! Edited to add: Just wanted to share an awesome give-away going on. My friend Lexy is an amazing artist. She's having a contest and you have a chance to win a board-mounted canvas giclee of one of her beautiful pieces when you leave a comment. So hop on over here and show her some love. LOVE, LOVE, LOVE the newest angel. You are so gifted, it is beautiful. That is the best ice cream EVER, thanks for posting the recipe. We will miss you at the FLOCK social. We miss all of you so much. Have a good weekend, way to go on the fair. The ice cream sounds delightful! Beautiful! I just love the picture! I LOVE the rose halo in her hair and the look of sheer delight and adoration on her face! Congratulations on the win, also! What an incredible accomplishment! I am so happy for you! Wow, this is awesome. Just beautiful. Congratulations on the Fair too! Way to go. I love your art! Congratulations on winning at the fair. This little angel Hope is for sure a prize winner, also. It's my favorite. You're so blessed to have this talent and you bless others thru this. Keep on painting! Congratulations. Your angels are angels for sure. Nice work. What a truly beautiful series. I was pleasantly surprised to see a blonde angel, she is gorgeous. I love (and agree with) your interpretation of the butterfly as a symbol of hope. You are so talented and it is a privilege and joy to see your creations. 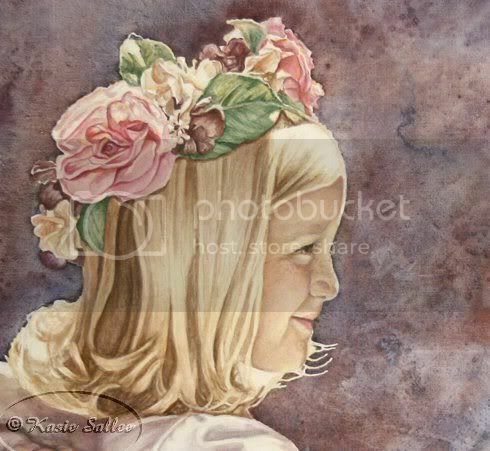 Gorgeous painting Kasie! And congrats on the win! I love butterflies, and your tiger swallowtail looks real enough to fly away and join the ones in my yard. 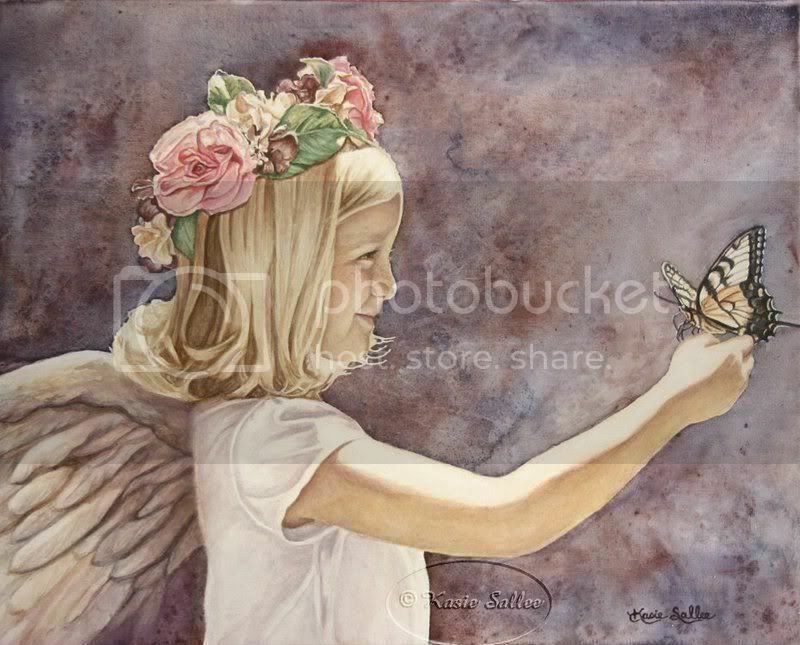 I love the Christian symbolism of butterflies, too. There never seems to be an end to the different symbols and illustration used in the Bible and over the generations to get the message across, and as an artist I just love that. Your angels are so sweet -- of COURSE you won at the State Fair...was there any doubt?! Congratulations, hermosa imagen muy bien lograda. Wow! I am soo impressed with this piece, and you KNOW I love butterflies. You have such a gift and I just wanted to say thank you for sharing it!! WOW! You are so talented!! !